Wisconsin Gov. Scott Walker talks about the budget bill during an interview in his office at the Capitol in Madison on Friday, March 18, 2011. Gov. Scott Walker calls it a needed fix to a flawed policy. Critics call it a giveaway to corporations. Either way, changes to a corporate tax law proposed in Walker's budget may mean businesses would pay the state about $46 million less in taxes over the next two years — and $40 million less each year after that. And state officials could be prohibited from challenging the tax claims of large corporations and their subsidiaries, including companies suspected of exploiting loopholes to dodge taxes. On the campaign trail, Walker had vowed to repeal the law, known as combined reporting, calling it a a "job killing" tax. The law effectively requires any company doing business in Wisconsin and its subsidiaries to file taxes as if they were one corporation. Companies in these "combined" groups are still required only to pay taxes based on their income generated in Wisconsin. 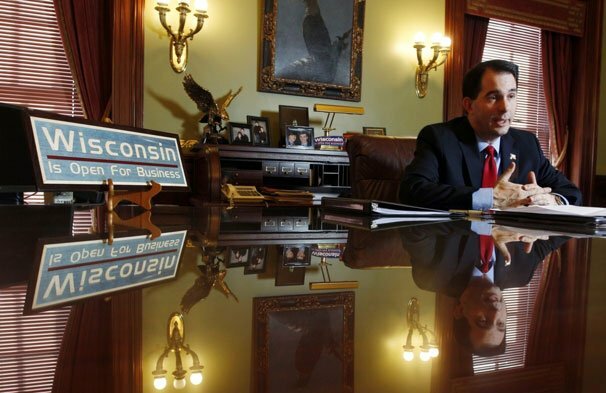 Walker blamed the law, signed by former Democratic Gov. Jim Doyle in 2009, for costing Harley Davidson about $22.5 million and threatening jobs at companies like Kimberly Clark and Briggs and Stratton. But doing away with combined reporting altogether could cost the state as much as $346 million in tax revenue through 2013, according to Department of Revenue estimates. Earlier this month, Walker told the State Journal he decided to try to modify the law instead after hearing from business leaders across the state that it could be "livable" with some changes. One of those changes would allow a combined group — if any of its individual companies suffered losses before 2009 — to claim up to 5 percent of those losses as to reduce taxes for the entire group. Currently, only losses suffered by member companies in 2009 or later can be taken into account by the group. The change could allow up to 400 corporate groups to claim a bigger deduction, reducing corporate taxes by $46.4 million over the next two years and about $40 million per year after that, according to the state Department of Revenue. Walker's budget also would prohibit the Revenue Department from challenging how corporations and their subsidiaries combine, or report their operations, for tax purposes. The policy is intended to prevent companies from dodging taxes by, for example, stashing their assets in a subsidiary company or reporting group-wide losses but not profits. But critics said the law lets state officials reject how companies and their subsidiaries report their taxes if it would result in a revenue loss for the state and only approve those corporate combinations that would result in higher tax revenues. "Now, they get to pick and choose, and that's just fundamentally wrong," said James Buchen, vice president of government relations at Wisconsin Manufacturers and Commerce. Jack Jablonski, executive assistant at the Revenue Department, said the agency has never actually challenged how any corporations and their subsidiaries filed their combined taxes since the law went into effect. Including Wisconsin, 23 states require some form of combined reporting. Republicans and business interests criticized the passage of Wisconsin's law at the time, saying it was being rushed through by Doyle and the Legislature, then controlled by Democrats, without fully taking things like losses into account. Walker described the changes he's seeking as minor adjustments, but critics accuse him of weakening the law. "The governor wants to reopen loopholes for big corporations," said Jack Norman, research director at the Institute for Wisconsin's Future. He said Walker is trying to assist large corporations like Marshall & Ilsley Corp, which lost about $2 billion in 2008 alone. Norman said Walker's proposal seems "well designed" to help campaign contributors. Todd Berry, president of the Wisconsin Taxpayers Alliance, said Walker's proposal would simply fix "goofs" made by those who drafted the current law. The idea of combined reporting came up long before it became law in February 2009. Longtime Republican Gov. Tommy Thompson proposed it in the late 1990s as part of a larger corporate tax package that also offered tax breaks for businesses. Lawmakers adopted the tax cuts but declined to pass combined reporting at the time. 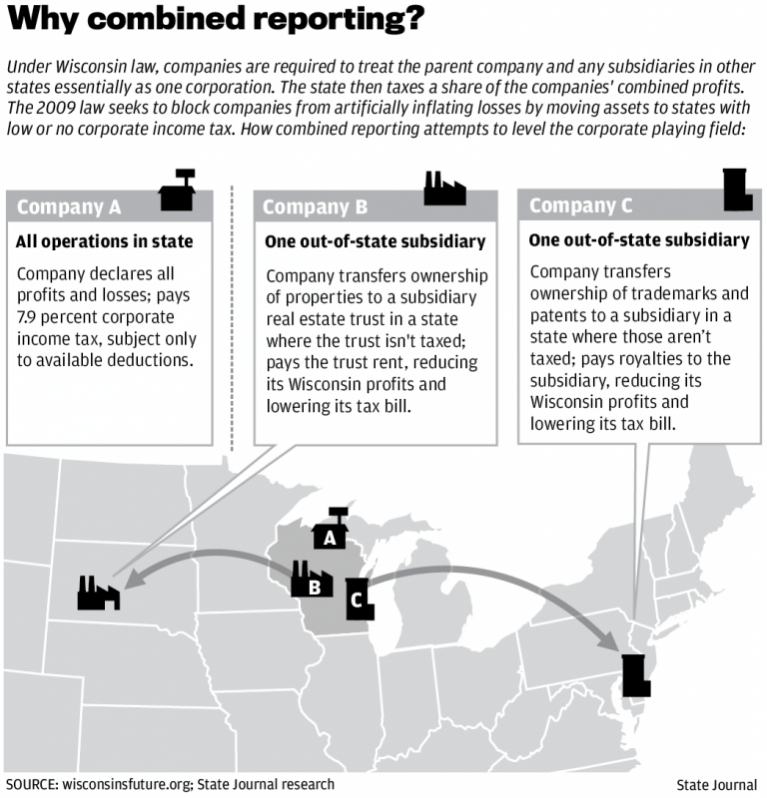 Proponents of the law say combined reporting prevents corporate tax evasion, and helps smaller businesses compete with large national and multi-national corporations, which can shuffle their assets around to avoid Wisconsin taxes. "Last session, we finally closed this gaping loophole and made sure that the largest multistate corporations were paying their fair share and not shifting the burden to to all of our smaller and medium Wisconsin businesses, all our Main Street businesses, and individual taxpayers," said state Rep. Donna Seidel, D-Wausau. "It was clearly a matter of fairness." She said forbidding the Revenue Department from challenging suspected corporate tax dodgers could cost the state "multiple millions" of dollars, and fears Walker's ulimate goal is the "complete dismantling" of the law. Seidel and others say Walker is helping the wealthiest corporations dodge financial responsibilities during tough times while cutting tax assistance for low-income people. "Where's the shared sacrifice?" asked Scot Ross, executive director of the liberal group One Wisconsin Now, noting Walker's budget reduces corporate taxes while trimming nearly $50 million in tax credits for seniors and the poor. But Walker spokesman Cullen Werwie said the budget is aimed at helping all residents, including low-income people who are unemployed or underemployed, by helping businesses create jobs. "Democrats who are claiming that the budget as a whole adversely affects those who are truly in need of assistance are either ignoring the facts or simply misinformed," he said. A potential $636 million boost to the state’s coffers the next three years has Republican leadership at the Capitol optimistic about the future but wary of changing course during the ongoing budget debate.